With this ruling, and the judgement settled, none of the former employees will ever have to pay Michael Robertson ONE PENNY. 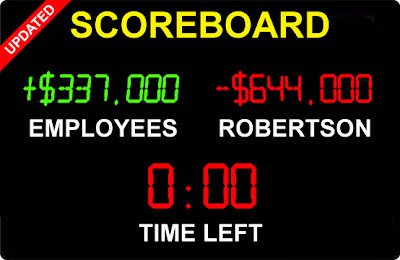 Robertson, however, continues to dodge paying the judgement against him (via his company), still owing hundreds of thousands of dollars to one of the former employees. As Judge Taylor pointed out in his previous ruling, Robertson's attacks were driven by his ego. In the end, this was a simple case of Robertson's greed and ego vs me wanting to treat good employees with some respect.